The world's most powerful car and motorcycle dryer just got better! 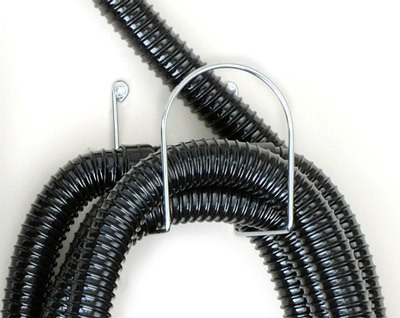 The Master Blaster Revolution has all the features of the regular Master Blaster, plus front wheels that swivel, a wall mount bracket, and a hose rack for easy storage. Dry your car, bike or RV with the biggest and baddest blow dryer on the market! 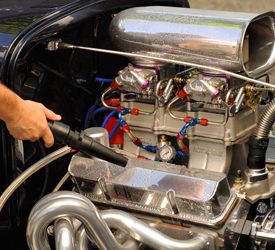 The MasterBlaster MB-3 was built to blast the water off your bike or vehicle faster than any other blower can. Water is easily and thoroughly eliminated from every crevice on your motorcycle, car or truck. The MasterBlaster has an 8.0 Peak horsepower motor that blasts air at an impressive 58,500 feet per minute compared to the Air Force Blaster blowing 29,250 feet per minute. The MasterBlaster now comes with wheels for easy maneuvering around your vehicle or bike. This blower is equipped with two levels of velocity for super fast drying or for blowing off smaller more fragile areas. The filter on this beauty is easy to clean and can be washed and reused. Your vehicle will be gleaming in no time so you can hit the road and cruise on into the sunset. 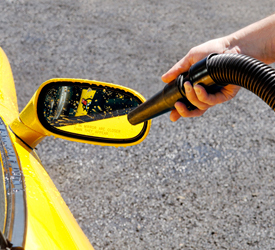 The Metro Master Blaster is a touch-free way to dry your vehicle! Eliminate the risk of fine swirls caused by rough towels. In addition to the front wheels that swivel and the wall mount bracket, the Master Blaster Revolution also includes a hose rack for easy storage! • Sturdy Steel- weighs only 16 lbs. • One year manufacturers warranty. Use this powerful blower tool to dry vehicles also! The best investment for my car I ever made.The best nozzle in the kit: large fire hose nozzle. Forget leaf blowers. Drys average size cars in minutes without touching. car. Also blows off dust after car is setting in garage for awhile better than anything else, including California duster. THIS BLOWS WARM DRY AIR!!!!!!!! I also built some drying wands like i saw in videos. Don't bother! Use the fire hose nozzle.Watch those how to videos using THIS nozzle! ProsBuild quality, performance, utility ease of use. ConsFor best performance you need a 20 Amp circuit with 20 Amp plugs . I also needed a 20 Amp extension cord. I already had the 20 Amp circuit breaker. Just had to convert to heavier plugs . Also built 15 ft extension cord with heavy duty plugs. Total cost $80 . the long and frustrating way to dry your car. takes longer than using towels, constantly chasing water droplets before they dry to spots. Really only useful for getting water out of crevices. High quality piece, but the dumbest thing I ever spent this much money on. I use the master blaster for drying after wash, i love this machine. thank you auto geek! Conshose made out of cheap plastic, need to work on that. I have the 4hp version of the Master Blaster, and it' ok. Now I bought this 8hp version and WOW this thing is amazing. I can dry the whole car in just a few minutes. The power is incredible! Metro shouldn't even sell the 4hp version with this out there. Also, make sure if you use an extension cord that it's 12 or 10 gauge. ConsGet's very hot when using it for extended periods. I had to use gloves when holding the hose. A little pricey. I think they should get rid of the 4hp version all together.